How Long does it take to install a Mains Fed, Point of Use Water Cooler? Posted to Tips & Tricks on Tue, 07 Jan, 2014. Be be aware that Mains fed and point of use are the same, just different wording is used within some industries. 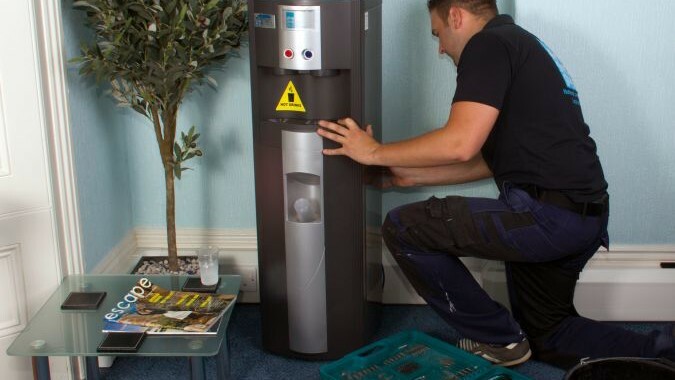 You will be so surprised with the ease of this, a mains fed water cooler is connected directly to the mains water supply within your establishment. With a filtered mains fed water cooler it reduces the chlorine, fluoride and earthy taste to your drinking water. The taste is vastly improved and you will be so surprised. From having a Gorilla waterCooler, mains fed water cooler within your work space you will see other advantages: hydration in the work place, increased energy levels, less sick days for your business which helps with productivity I think you will agree? After having our WRAS approved engineer complete a site survey report which is discussed with the above in mind. We will then return to our office to complete a method statement and risk assessment on the install in hand. Once we do this, we will then process your requirements taking into account your needs. On the agreed date we will action our approved WARS engineer to arrive to site and unload in a safe, manageably way. A typical install involves temporarily turning off the water supply to the targeted area, a few mins in most cases. Insert a T-piece or saddle value before installing a install rail which consists of an isolator, non returning valve, pressure reducer and a water block leak detector. From this point we run 15mm or 8mm flexi hose, using market leading John Guest push fittings into the back of the machine with clips to finish the jobs to a high professional finish. Once this is all in place and to the WRAS agreed pipework installed finish. Gorilla WaterCoolers will place the Ebac manufactured Water Cooler or our increasing Marco Eco hot water boiler range to the agreed postion. We will commence testing and provide a full commissioned water cooler before your first use. Gorilla WaterCoolers want to provide you, the client with the best experience so full training is provided. We also arrange 14 day follow up call to all installed water coolers. We provide all our customers with a signed site survey, agreed service levels and approx. future times of the service / filters changes for complete piece of mind. Gorilla WaterCoolers has over 90 years of water cooler experience within our team and happy to answer all questions.